I've always liked Siamese cats. Students do, too. "Why Siamese cats wear masks" is always a favorite story in genetics class. So, when I opened my January copy of The Science Teacher, I was thrilled to see an article on Siamese cat colors and proteins AND molecular genetics (1). In the article, the authors (Todd and Kenyon) provide some background information on the enzymatic activity of tyrosinase and compare it to the catechol oxidase that causes fruit to brown, especially apples. Tyrosinase catalyzes the first step of a biochemical pathway where tyrosine is converted to dopaquinone and then to the dark colored substance, melanin. 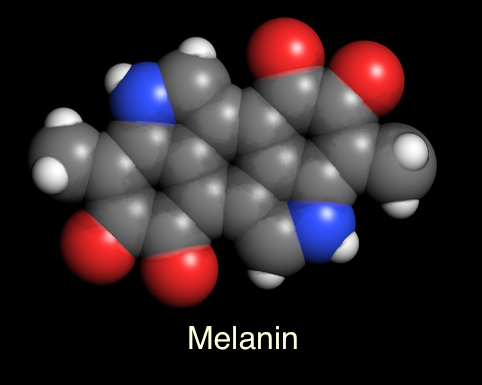 Melanin is responsible for the brown color in the ears, paws, tail, and face of Siamese cats. ​​​​​​The fun part of the story is that some versions of the tyrosinase gene have a mutation that makes this enzyme less stable at warmer temperatures. In warmer areas of the cat, such as the trunk, less melanin is produced, giving the cat a lighter colored body. I love the story of the coat coloring and I think this activity has the potential to interest students. I also like the approach that the authors take with discussing proteins and the associated phenotypes first before getting into DNA and the central dogma. I use this same order in my bioinformatics class. There are, however, a few things that I would change with this activity. First, the article and the teacher guide have the structure of tyrosine wrong. Tyrosine only has one hydroxyl group attached to the six-carbon ring, as shown below, not two hydroxyl groups as shown in the article and the teachers' guide. Space-filling models of Tyrosine and Dopaquinone downloaded from the NCBI's PubChem database are shown below. Second, I think the authors include way too many different protein stories and different explanations for why a protein might be inactivated. Todd and Kenyon have done quite a bit of work creating activities with several different proteins. But I think the plan to have students cover all eight proteins in six days would be too confusing for many students. The activity has students read about or work with: lactase, cellulase, tyrosinase, catechol oxidase, proteases, kinesin, galactosyl transferase, and tyrosine kinase, not to mention Gleevec and the way it interacts with the BCR-ABL fusion protein. I teach a college bioinformatics course and even the best of my students would get confused by looking at eight different proteins without some kind of common thread. The take home lesson that denaturation negatively impacts tyrosinase activity is easy to lose among all the unrelated activities. Where are the 3D models? When I read the description of the article, I thought it might include activities where students looked at 3D protein models to see how they changed when they were denatured by heat or pH. Instead, they just watch a short video. A better approach, I think, would be to have students work first-hand with structure models and see the change for themselves. Or maybe fry an egg. The effects of protein denaturation are pretty clear when you watch an egg cook. This is my bias, but I think an active learning approach, where students actually look at 3D protein and chemical models and identify chemical interactions, would be better in long run and better equip students for future learning. I think the common practice of hiding the biochemistry makes genetics much harder to understand and far less straightforward than it should be. 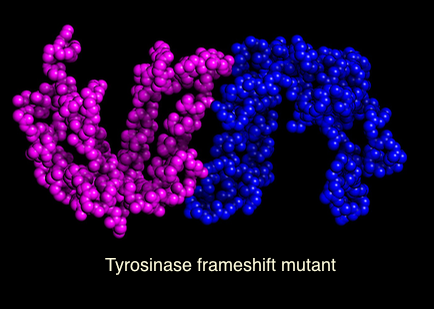 And, as it turns out there are 3D models of tyrosinase that students could use. They're from Bacillus megatherium, but that's how biology works. If an enzyme activity is beneficial, evolutionary processes tend to keep it around. Open Molecule World on the iPad (*). Color the protein chains by molecule. Open the sequence viewer and touch the name of the last row to select it. This row contains tyrosine, the substrate for the enzyme, and for each chain, two atoms of zinc. Change the coloring style to element. Now, you can see the substrate bound in the active site. Notice this protein has two identical subunits. Each one is bound to tyrosine and zinc. You may want to change the atom visibility to show all the atoms or just the core backbone, like I have here, to see how the tyrosine is positioned. *Many of the things I describe here can be done in Cn3D, but it's a bit more complicated. This next part is a little more complicated because I had to split the protein sequence into three parts to avoid introducing spaces. Touch the Selection button and paste the sequence below in the Select pattern window. Start the search. The pasted sequence will be highlighted in the protein sequence. When you're done highlighting sequences, you'll see each subunit has a region that appears brighter and a region in the center that appears more dim. The bright colored residues are incorporated into the protein before ribosomes encounter the frame shift mutation and a stop codon shortly afterwards. This portion of the protein can be produced in the albino cat. Look at the dim areas of each subunit. These amino acids would be lost when the frameshift mutation is present. 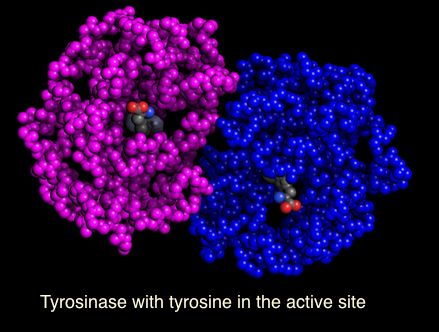 Notice where the tyrosine is located. Residues that would be lost because of the frameshift mutant are shown in gray. ​​​​​​To make the mutations affect on the protein even more clear, open the Show/Hide button and choose "Hide unselected." The amino acid residues that would be lost because of the mutation disappear. Residues that would be lost because of the frame shift mutation are hidden. ​​​​​​​Now, it's really clear. 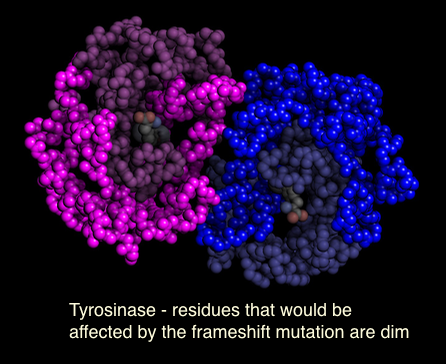 If the residues that bind tyrosine and modify it's structure are gone, the enzyme is unable to function. If we don't have tyrosinase working to help make melanin, we get white cats. Imes D, Geary L, Grahn R, Lyons L. Albinism in the domestic cat (Felis catus) is associated with a tyrosinase (TYR) mutation. Animal Genetics. 2006;37(2):175-178. doi:10.1111/j.1365-2052.2005.01409.x.